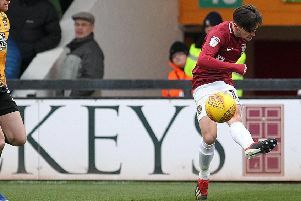 Boss Jon Whitney is warning his Walsall players to expect a Cobblers backlash when they walk out at Sixfields on Saturday. The Saddlers make the short trip down the motorway full of confidence, having won their past three games in Sky Bet League One. Their mood is in stark contrast to Town’s, who are without a win in six matches in all competitions, and are still licking their wounds from last Saturday’s 5-1 hammering at the hands of Oldham Athletic. But Whitney believes that Boundary Park bashing will have ensured Town boss Jimmy Floyd Hasselbaink will have his team fired up for this weekend, and he believes his team could be in for one of their ‘toughest matches of the season’. “I know Jimmy Floyd Hasselbaink because we are on the same LMA course and he will demand a response from last week,” said Whitney, who saw his Walsall side beaten 2-0 on their most recent visit to Sixfields in September, 2016. “We are expecting one of our toughest games of the season. They are fighting and they need a result. “Jimmy is hurt from any defeat. But in the press he made it clear the first half last week just wasn’t good enough. “Northampton are going through a tough time, but Jimmy is a seasoned pro who is very driven. “He will be looking to get to January and I’m sure then he will make a couple of changes. But he has got some class in his side. “When you look at the players he has got available. John-Joe O’Toole has got a slight knock but I expect him to play because he is a big player for them. “Matt Grimes is an important player. They have got some energy up top. Whitney then made it clear he will be instructing his team to get out of the blocks quickly, and aim to take advantage of a Cobblers team whose confidence is fragile at best. “I think the start of the game will be important,” said Whitney. “The first goal is always important in these games. We have to make sure we stay nice and solid and focused.